AAA Sports Club runs a basketball skills clinic every Thursday in Irvine. Choose from two training groups (beginner & intermediate) for boys and girls ages 5-12. Practice is at a state-of-the-art facility in Irvine, baskets are lowered and youth-sized basketballs are used. Players will learn the fundamentals of basketball, participate in fun and challenging drills, and play in scrimmages. All coaches are former college players. Summer camp also available. Prep Stars holds year-round and summer indoor basketball camps in Irvine at the Momentous Center (Thursdays 4:30pm-6:00pm). Check their website for this year’s summer camp schedules. Boys and girls of any skill level from ages 6-12 are all welcome. Kids who are new to the game can learn all the core basketball fundamentals to succeed in leagues and intermediate level players can continue to hone their skills with proper instruction from Prep Stars' high-level coaches. Daily activities include offensive and defensive skills training, conditioning, and scrimmages. There is a special basket lowered to eight feet to accommodate younger players. Multiple sign-up options are available, and no previous playing experience is required. For additional information, sign-up options, and schedules visit their website (www.ocprepstars.com), click the link in this box, or call (949) 466-3737. Blizzard leagues are designed to give players an extra opportunity to play competitively after or during college. Run 2-3 times a year, the leagues are run over the course of 10 weeks, where the first 8 weeks are used to determine standings for the 2-week playoff series. Come join the fun of youth recreation basketball offered by the City of Dana Point. League open to boys and girls, ages 6-9 yrs. This is a low-key, instructional basketball league. Games will be played on Saturdays at the Dana Point Community Center, with game times starting at 8:00am and running throughout the day. Registration begins in August with the league running December through March. Cost $20 for residents, $35 for non-residents. For more league information call (949) 248-3530. Basketball league for 3rd through 8th grade boys and girls. Registration is mid-June through mid-September. Skills evaluation is in September. Practices start in November and games start in December. All games are held on Sundays at local gyms. Find the city of the league on their website. 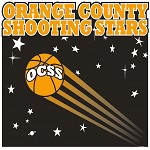 Orange County Shooting Stars is a competitive youth basketball league for boys and girls ages 6 to 13 based out of Orange, CA. Our main goal is to teach all of our players the fundamentals of the game of basketball and to develop their individual and team skills so that they can go on to play basketball at a more competitive level either now or in the future. All of our teams will practice once a week, and play one game every Saturday afternoon. If you are interested in playing, or if you have any questions, please click on the link above to check out our website or give us a call at (714) 357-0315. The YMCA of Orange County offers Basketball leagues for boys and girls ages 6-14. Youth basketball at the Y teaches the fundamentals of the sport, and develops skills (e.g., ball handling, passing, shooting, and defense) in a fun and supportive environment that emphasizes character development, teamwork, and good sportsmanship. This completely new, 32,000 square foot premises is located right off the 5 freeway at Bake Pkwy. In addition to the 4 basketball courts, the Center houses 5 volleyball courts, 4 Futsal courts, yoga studios and 8 table tennis courts. Their gym features a weight room, fitness room, coach/players room, concession area and a lounge for parents. A County-maintained facility featuring two, non-lighted basketball courts for day use only. No sports equipment provided. Park also provides restrooms, barbecues, play areas, picnic tables, ball diamonds, volleyball, racquetball courts, amphitheater, bicycle trails and fishing. Mile Square Regional Park is an urban park located in the City of Fountain Valley and totals 607 acres of land. Within the park's boundaries are basketball courts, community center building, ball diamonds, outdoor play areas and a tennis court complex. Night lighting is provided on much of the outdoor facilities to extend playing hours. Two sand volleyball courts are available for public enjoyment in this multi-recreational park. Right on the beach, Capistrano Beach Park has a basketball court with lighting , public restrooms, outside showers, seven volleyball courts, and fire rings. A paved parking lot for 140 cars is provided. Dogs are not allowed on the beach. Situated on 36 acres, the park features basketball and volleyball courts as well as other recreational amenities.